The holiday got me thinking a little bit about independence — what does that word mean to you? I know that for a lot of our Look, Cook, and Eat friends, a large part of being independent is being able to do daily life “things,” like living on their own, shopping, cooking, volunteering, working, making choices, and contributing to their communities. One of the goals of LCE is to help people with disabilities be more independent in the kitchen. Because there is no better feeling than cooking a meal for you and your friends and family, and then sharing it with them. 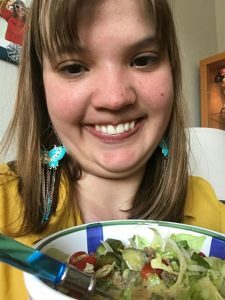 So in this blog post I thought it’d be fun to introduce you to some of the people who use LCE and tell you about their kitchen success stories and path to independence! Ready? Let’s go! 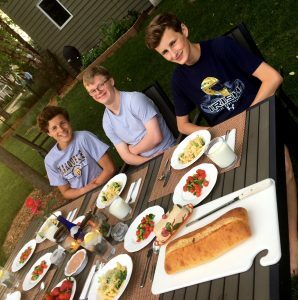 This is John (he’s in the photo at the beginning of the blog and in the middle in the picture above) with two of his three brothers. John, who lives in Iowa, is a big fan of LCE (check out his latest appearance on Facebook! He and I made Circus Dogs and Ice Cream Sandwiches and they were delish! ), and his family LOVES it when he cooks for them. 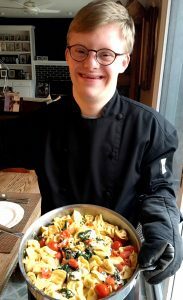 In the picture he made Creamy Broccoli Pasta, Easy Tomato Salad, and Chocolate Dip with Fresh Strawberries, but my favorite thing is that smile — THAT’S what we aim for as we create and promote LCE. Delicious meals that are easy to make and awesome to share. Success! I met Allie (above) a few months ago via email (she lives in Minnesota), and it wasn’t long before she sent me this picture after she made Cheeseburger Soup by herself. To quote, “Sooooo good!” Allie is really excited to have LCE as a resource, and she is going to tell her Life Skills teacher about it when she starts school again in the fall. 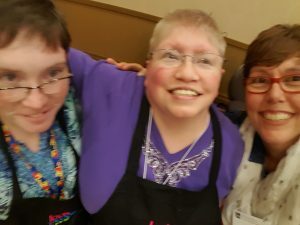 Devon (center) and Becky (left) were my helpers at a conference in Chicago last summer where they cooked Asian Turkey Lettuce Wraps in front of about 100 people! They did an amazing job and the wraps were so good! Becky is from Canada and posts photos of her cooking adventures on our LCE Facebook page — she made Potato Ham Soup a few months ago and said it turned out great. Devon is from Kansas, and was a guest in the LCE kitchens earlier this spring where we made Minty Chocolate Brownies together. Both women are self-advocates in their communities and work hard at promoting the potential of people with disabilities. Independence means different things to different people, but I think we can all agree that people with disabilities have the right to be as independent as they possibly can and want to be. Cooking may or may not be part of someone’s plan for becoming self-sufficient, but I’m glad LCE is there to help anyone who wants reach a higher level of independence in the kitchen. Learning to cook is a way to celebrate Independence Day every day of the year! How cool is that?